The 80/20 Principle states that in any situation roughly 80 percent of the 'work' will be done by 20 percent of the participants. This idea is central to the Law of the Few theory where a tiny percentage of people do the majority of work. But say you took those 20 people who do all the "work" away, would changes or epidemics never occur or would the next 20 people step into that role and assume the position of "workers"? Is one born an exceptional person, a 'one of the few,' or could someone eventually learn how to become a member of this exceptional group? Stickiness means that a message makes an impact and doesn't go in one ear and out the other. Take a simple, every day example of this. Think about a song that you couldn't get out of your head or that television commercial you still remember from when you were a kid. Could you pinpoint what it is you think makes them "sticky?" This says that human beings are a lot more sensitive to their environment than they may seem. How attuned are you to your environment and its effect on you? Have you felt your mood change because of the surroundings even if it's as subtle as standing near a couple in a bitter argument or being in a cluttered, messy bedroom? Malcolm also talks about 3 kinds of people :: connectors (people who have strength in their weak ties with others and connect people together) / mavens (people who love to research ideas/ products and then share that information with others) and salespeople (people who take the idea and persuade others to take up the idea) :: I actually see myself in all three roles, certainly the first two. There is so much in this book for me to blog about... what I would say is that its the small things that make the tipping point... what small things could we do to make the difference in our own situations? 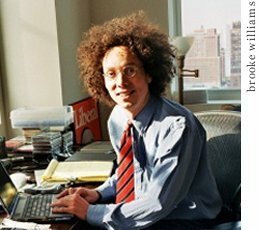 Check out Malcolm's webspace :: gladwell(dot)com and read up on his work. We need more boffins like him! folk we can understand and relate to... with cool hair! I'm reading Blink right now. I really appreciate the simple conversational style of his writing. Makes his books and easy read.